Feline Hyperesthesia - Also known as twitchy cat syndrome. It can be very distressing for your cat and you too when you have to watch your cat suffer. If you have a twitchy cat who chases and bites their tail then you may have a cat with this condition. I hope my article will help to shed some light on this distressing Illness. I am writing this article for several reasons. Firstly I had a cat who suffered with something like this and I know just how upset I was to see her so distressed. Secondly, I am contacted quite often by people whose cats are suffering with similar itchy cat symptoms and are finding it difficult to get any answers from their vets. This may be because Feline Hyperesthesia is one of those cat illnesses that are difficult to diagnose and some vets may have never come across it before. Let’s start by talking about what the symptoms are. Some cats may experience all of these symptoms frequently, while others have short bursts of them. They may also vary in their intensity. Cat twitching under its skin, mainly along the back. It looks like rippling skin. 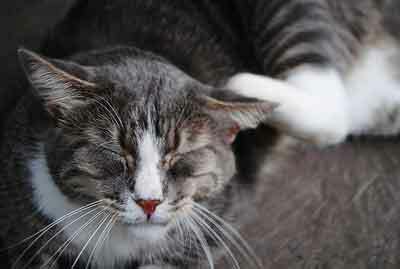 Biting at the base of the tail, which may lead to fur loss or sores to develop? In this short video you will be able to see the rippling back often associated with this condition. There is no one test that can be used to diagnose Feline Hyperesthesia. Because of this when a vet is presented with a cat with these symptoms he will have to go through a serious of tests to eliminate other possibilities from the list before a diagnosis of Hyperesthesia can be diagnosed. Usually the vet will spend some time examining your pet to look for any obvious causes of your cat twitching such as fleas and other parasites or skin conditions and signs of allergies. They will then spend some time talking with you about any possible changes which may have happened in the cat's environment recently such as changes to their food (which may be the cause of a food allergy) or new pets, moving house or anything which would have changed the cats routine and that may have caused your cat some anxiety. The vet may then do further tests such as a neurological exam, blood work, skin scraping and spinal x-rays, if there are no obvious indications for the behaviour. Sometimes it is a good idea to video your cat displaying these symptoms so that you can show your vet at the surgery. Because there are so many possible causes for Feline Hyperesthesia, there is no one treatment available. In fact your vet may have to advise you that there will have to be a period of trial and error to see what works best for your particular cat. Because anxiety may be playing a large role in the onset of these symptoms, often the vet will ask you to make changes at home first to see if any possible causes of anxiety can be removed to see if this helps to reduce the symptoms. These drugs may be able to be reduced or stopped over time; however some cats may always have to take them. Regular blood work will have to be done to monitor the condition and the affects of the drugs on your cat. Herbal Supplements - There are some herbal supplements available that can help reduce stress levels in cats such as Stress Gold. 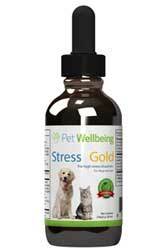 These are formulated by veterinarians to help relax their nervous system and reduce excitability, stress and nervousness. You should still check with your vet before using any complementary medicine or herbal supplement because there can be interactions with conventional medicines. And always carefully follow the manufacturer's guidelines. Distraction - Often distracting your cat when one of these attacks occurs can help to stop it or to reduce its length and severity. This can be something as simple as tapping the cat on the tail, or may involve playing games with your cat or making his home environment more stimulating. Environment - Reducing any possible environmental stressors in your home may also help the cats over all condition. If your home is particularly noisy, make sure your cat has a quiet place they can escape to. Try not to move furniture around too often or change the cat’s food bowl, bed or litter tray position. Cats with this condition also respond well to routine. So make sure that you feed your cat at the same time every day and preferably in smaller meals throughout the day, rather than two large meals if possible. As you can see Feline Hyperesthesia is far from straight forward and is no wonder that it goes undiagnosed. It is important that if your cat displays these itchy cat behaviours and other symptoms that you take them to see a vet as soon as possible. There may be some other underlying cat illnesses which may be triggering your cat's anxiety and leading to these distressing physical symptoms.